Omar Khayyam (Persian: عمر خیام), (born 1048 AD, Neyshapur, Iran—1123 AD, Neyshapur, Iran), was a Persian polymath, mathematician, philosopher, astronomer and poet. He has also become established as one of the major mathematicians and astronomers of the medieval period. Recognized as the author of the most important treatise on algebra before modern times as reflected in his Treatise on Demonstration of Problems of Algebra giving a geometric method for solving cubic equations by intersecting a hyperbola with a circle. He also contributed to calendar reform and may have proposed a heliocentric theory well before Copernicus. His significance as a philosopher and teacher, and his few remaining philosophical works, have not received the same attention as his scientific and poetic writings. Zamakhshari referred to him as “the philosopher of the world”. Many sources have also testified that he taught for decades the philosophy of Ibn Sina in Nishapur where Khayyam lived most of his life, breathed his last, and was buried and where his mausoleum remains today a masterpiece of Iranian architecture visited by many people every year. Outside Iran and Persian speaking countries, Khayyam has had impact on literature and societies through translation and works of scholars. The greatest such impact was in English-speaking countries; the English scholar Thomas Hyde (1636–1703) was the first non-Persian to study him. However the most influential of all was Edward FitzGerald (1809–83) who made Khayyam the most famous poet of the East in the West through his celebrated translation and adaptations of Khayyam’s rather small number of quatrains (rubaiyaas) in Rubaiyat of Omar Khayyam. 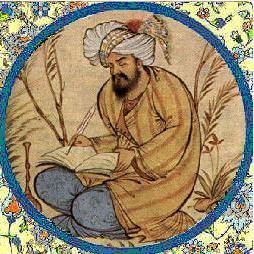 Omar Khayyam was famous during his times as a mathematician. He wrote the influential Treatise on Demonstration of Problems of Algebra (1070), which laid down the principles of algebra, part of the body of Persian Mathematics that was eventually transmitted to Europe. Like most Persian mathematicians of the period, Omar Khayyám was also famous as an astronomer. Omar Khayyam was part of a panel that introduced several reforms to the Persian calendar, largely based on ideas from the Hindu calendar. On March 15, 1079, Sultan Malik Shah I accepted this corrected calendar as the official Persian calendar. Omar Khayyám also built a star map (now lost), which was famous in the Persian and Islamic world. It is said that Omar Khayyam also estimated and proved to an audience that included the then-prestigious and most respected scholar Imam Ghazali, that the universe is not moving around earth as was believed by all at that time. By constructing a revolving platform and simple arrangement of the star charts lit by candles around the circular walls of the room, he demonstrated that earth revolves on its axis, bringing into view different constellations throughout the night and day (completing a one-day cycle). He also elaborated that stars are stationary objects in space which, if moving around earth, would have been burnt to cinders due to their large mass. Some of these ideas may have been transmitted to Western science after the Renaissance. Omar Khayyám’s poetic work has eclipsed his fame as a mathematician and scientist. He is believed to have written about a thousand four-line verses or quatrains (rubaai’s). In the English-speaking world, he was introduced through the Rubáiyát of Omar Khayyám which are rather free-wheeling English translations by Edward FitzGerald (1809-1883). Other translations of parts of the rubáiyát (rubáiyát meaning “quatrains”) exist, but FitzGerald’s are the most well known. Translations also exist in languages other than English. Ironically, FitzGerald’s translations reintroduced Khayyam to Iranians “who had long ignored the Neishapouri poet.” A 1934 book by one of Iran’s most prominent writers, Sadeq Hedayat, Songs of Khayyam, (Taranehha-ye Khayyam) is said have “shaped the way a generation of Iranians viewed” the poet. Omar Khayyam’s personal beliefs are not known with certainty, but much is discernible from his poetic oeuvre. Despite strong Islamic training, it is clear that Omar Khayyam himself was undevout and had no sympathy with popular religion, but the verse: “Enjoy wine and women and don’t be afraid, God has compassion,” suggests that he wasn’t an atheist. Some religious Iranians have argued that Khayyam’s references to intoxication in the Rubaiyat were actually the intoxication of the religious worshiper with his Divine Beloved – a Sufi conceit. This however, is reportedly a minority opinion dismissed as wishful pious thinking by most Iranians. It is almost certain that Khayyám objected to the notion that every particular event and phenomenon was the result of divine intervention. Nor did he believe in an afterlife with a Judgment Day or rewards and punishments. Instead, he supported the view that laws of nature explained all phenomena of observed life. One hostile orthodox account of him shows him as “versed in all the wisdom of the Greeks” and as insistent that studying science on Greek lines is necessary. He came into conflict with religious officials several times, and had to explain his views on Islam on multiple occasions; there is even one story about a treacherous pupil who tried to bring him into public odium. The contemporary Ibn al Kifti wrote that Omar Khayyam “performed pilgrimages not from piety but from fear” of his contemporaries who divined his unbelief. Khayyám’s disdain of Islam in general and its various aspects such as eschatology, Islamic taboos and divine revelation are clearly visible in his writings, particularly the quatrains, which as a rule reflect his intrinsic conclusions describing those who claim to receive God’s word as maggot-minded fanatics. Khayyam himself rejects to be associated with the title falsafi- (lit. philosopher) in the sense of Aristotelian one and stressed he wishes “to know who I am”. In the context of philosophers he was labeled by some of his contemporaries as “detached from divine blessings”. Khayyam the philosopher could be understood from two rather distinct sources. One is through his Rubaiyat and the other through his own works in light of the intellectual and social conditions of his time. The latter could be informed by the evaluations of Khayyam’s works by scholars and philosophers such as Bayhaqi, Nezami Aruzi, and Zamakhshari and also Sufi poets and writers Attar Nishapuri and Najmeddin Razi. As a mathematician, Khayam has made fundamental contributions to the Philosophy of mathematics especially in the context of Persian Mathematics and Persian philosophy with which most of the other Persian scientists and philosophers such as Avicenna, Biruni, and Tusi are associated. There are at least three basic mathematical ideas of strong philosophical dimensions that can be associated with Khayyam.